“I prayed non-stop,” Nik Wallenda said after becoming the first man to walk over Niagara Falls on a tightrope. Walllenda explained that he grew up in a “Bible-believing, God-fearing family” and that his Christian faith is “the most important part of my life.” He fasted for eight hours, then joined hands in a small circle with his wife Erindera and three children and prayed before setting out. The 25-minute spectacle on June 15 was televised live. 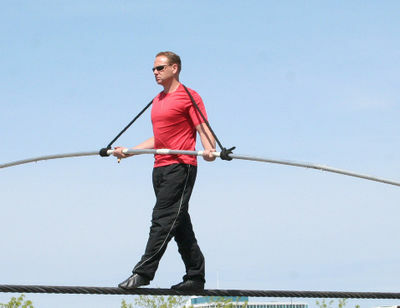 Wallenda wore a headset during the walk and could be heard saying, “Oh Lord, You’re my Saviour, You’re my King … You’re my Jesus, my Counsellor. You’re my Wisdom. I praise you, Jesus. Thank you, Jesus. Thank you, Lord. I praise you, my Father.” The 33-year-old acrobat is a seventh-generation member of the famous Wallenda family of circus performers. The family has suffered two deaths from falls while performing, including Nik’s great-grandfather in 1978. After he finished his walk over the falls, a Canadian customs agent asked Wallenda for his passport and questioned, “What is the purpose of your trip?” He responded, “To inspire people around the world.” Wallenda next plans to walk across the Grand Canyon.